Here is a quick reminder that our February WiN meeting is Thursday, Feb 2nd at Adelaide Place from 11:30am to 1:30pm. 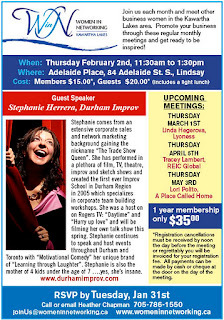 I am excited to let you know that Stephanie Herrera of Durham Improv will be our guest speaker. Full details below. The deadline to register is Tuesday, Jan 31st. Please let me know if you will be attending by calling 705-786-1550 or by email at joinus@womeninnetworking.ca.